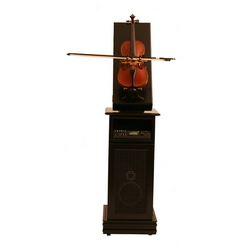 The dream of a violin that can play itself has tantalized inventors for over a century. Now, modern technology has made the dream a reality - and without the use of digitally sampled sounds! Piano accompaniment can be derived from any midi source, but using Pianomation to play genuine acoustic accompaniment provides today's ultimate listening experience in automatic music. Purchase includes Chili Pianomation controller, Black display cabinet, and 40 watt Acoustic Research Speaker.